The most complete batsman with a superb technique for all formats of cricket, Tendulkar spent 24 years in international cricket and broke all batting records, we take a look at some of his unique records which will possibly stay forever. The greatest batsman to have walk on a cricket pitch, Sachin Tendulkar’s name appear in almost all sort of batting records. His career spanned over 24 years in international cricket, he made his debut in 1989 against Pakistan on 15th November 1989. We take a look his career statistics and the batting records on his name. 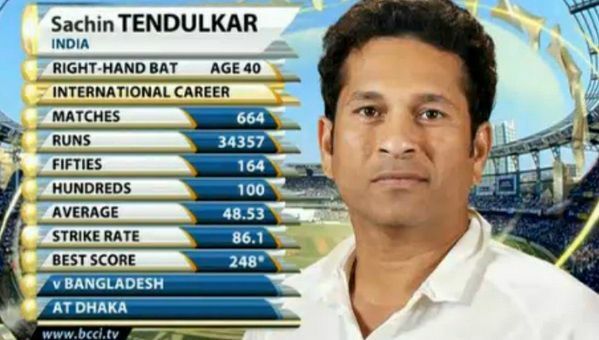 So above is the overall career record of Sachin Tendulkar in all major formats of cricket now we take a look at some of the individual records which he holds. A snap shot of his total international matches is given below while if you scroll further down the page you will see his individual records from his 24 years in cricket. 7 Only player to have scored 15000+ runs and 150+ wickets in ODI cricket.